Most modern cars have alloy wheels, many of which have fairly intricate designs. As these types of wheel tend to be relatively expensive it’s a good idea to keep them clean and protected. This requires getting right into the nooks and crannies to make sure that all remnants of brake dust and grime are completely removed. Bristles should be firm enough to give a little ‘oomph’ to the cleaning process, but not so firm or sharp-ended as to inflict scratches on to the delicate wheel finish. The ferrule (the ‘hub’ where the bristles are gathered together to join to the handle) should be plastic rather than metal. Plastic is softer than metal and is less likely to scratch the alloy should the ferrule collide with the wheel whilst you’re cleaning. 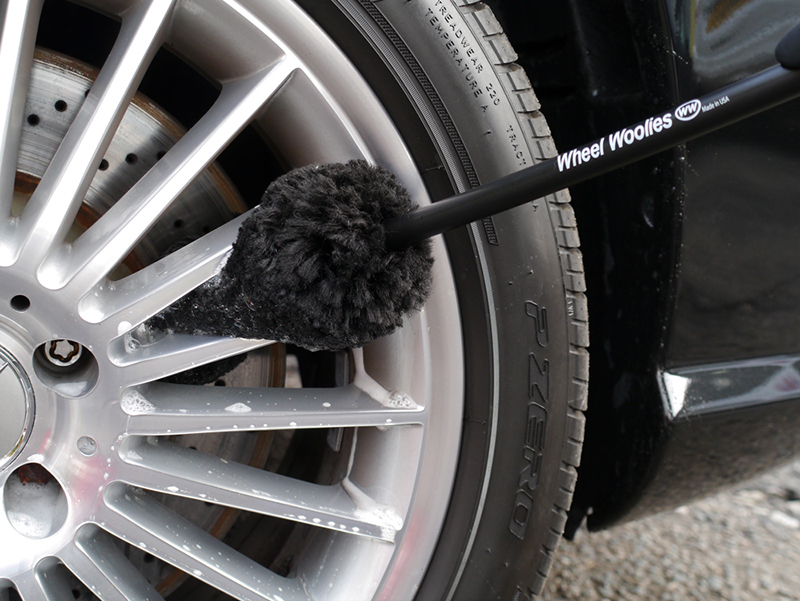 The handle should be long enough to allow you to fit the brush through the spokes to clean the back of the wheel. As it will be in proximity to the wheel ideally the handle will either be constructed of wood or plastic, again to reduce the chances of scratching the wheel. There are different styles and shapes of brushes available. Some are fairly traditional – rounded ends attached to a long handle, a bit like a paintbrush. Some are ‘Christmas tree’ shaped. Whilst these are great for cleaning the back of the wheel care should be taken as many of these have metal cores with the fibres twirled within. Over time the fibres become flattened which makes it easy for the metal core to come into contact with the wheel. Other brushes, or ‘woolies’ have no metal in their construction – the fibres are attached directly to a plastic core, and their elongated shape make reaching through the spokes to the back of the wheel easy – so this style is a particularly popular option.